The Big Wobble: Car wash septic tanks emerge as radiation threat in Fukushima: Amount of polluted sludge is estimated at several thousands of tons. Storage tanks at car wash facilities near a crippled Japanese nuclear power plant contain sludge which is seven times higher than the legal radioactive limit, Japan's Kyodo news agency reported Sunday. 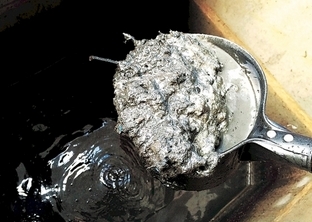 An inspection of car wash facilities in the Fukushima prefecture found sludge containing up to 57,400 becquerels of radioactive material per kilogram, compared with the limit of 8,000 becquerels per kilogram allowed by authorities, according to a document Kyodo obtained. The radioactive material is believed to come from ash and soot which was washed from vehicles shortly after the Fukushima Daiichi nuclear power plant disaster in March 2011, officials said. The six-reactor plant suffered a triple meltdown after it was hit by a magnitude-9 earthquake and resulting tsunami. Fukushima Prefecture has some 1,700 car wash facilities where a growing number of tanks are filled to capacity, officials said, adding the amount of polluted sludge is estimated at several thousands of tons. Last month the Japanese government said that the cost of decommissioning the damaged nuclear plant is expected to soar to hundreds of billions of yen annually from the initial estimate of 80 billion yen (766 million dollars) each year. Oh wow, septic tanks is just not a garbage tanks its now full of destruction materials .